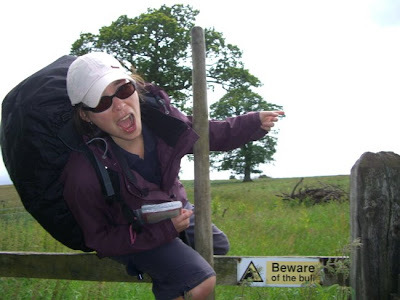 This blog is an account of our Coast to Coast walk across northern England the summer of 2007. We walked 192 miles(officially...more if you count all the random walks around villages) from St. Bees to Robin Hood's Bay with many an adventure along the way. The Coast to Coast across northern England from St. 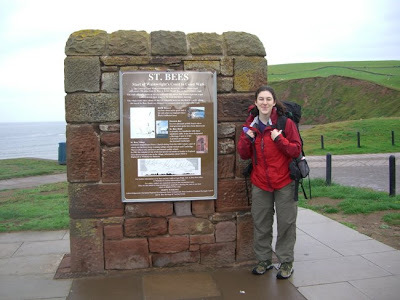 Bees to Robin Hood's Bay is a 192 mile walk based off the path that Alfred Wainwright walked and wrote about in the '70's. 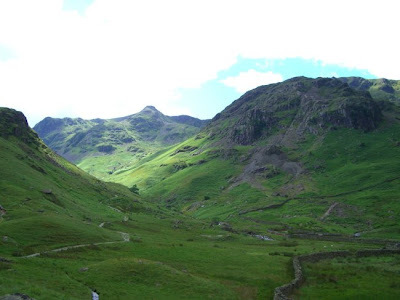 Wainwright was an avid walker and writer and wanted to try to walk across England using only public right of ways. 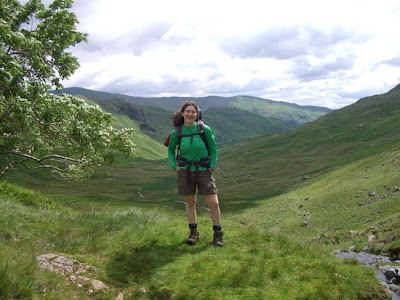 While not an official trail (Wainwright himself encourages people to make up their own ways of getting from one coast to the other), people come from all over to try it and it is considered one of the best long distance walks in the world. So how, you ask, did this whole idea come about? 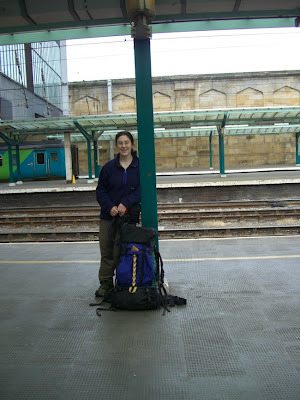 Why would we want to walk practically 200 miles across England in almost non-stop rain? It all started my (Coty) first quarter in college. Being in a new place where I didn't know anyone or about anything equaled lots and lots of time on the computer. 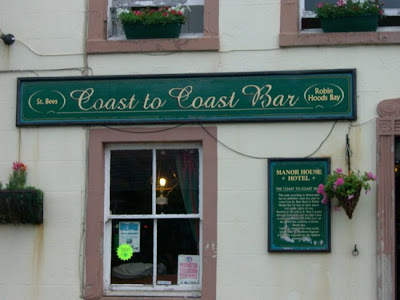 Which is how I stumbled across a web site about the Coast to Coast walk. I knew then that I wanted to try it and kept it in the back of my mind for three years. Then in my last year of school, after hearing from a friend who had just spent the fall in Ireland and another who had biked to Mexico, I decided that I was just going to do it. 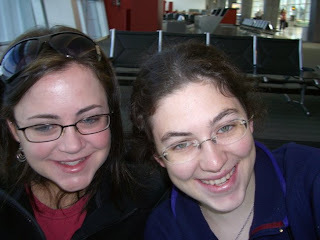 I graduated in June 2007 and a week later, there we were, Breanne (my sister) and I, riding a train from Manchester to St. Bees to start our adventure. I don't know why walking across a country appealed to me. 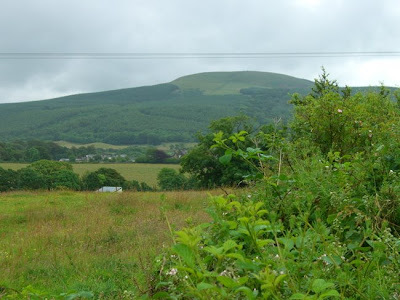 I had been to England once before and loved the countryside. I also like to be outdoors and wanted to do something that would challenge me. 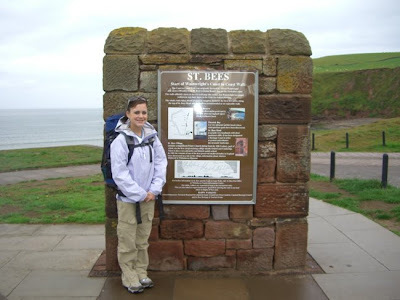 And how many people can say they walked across a country?! 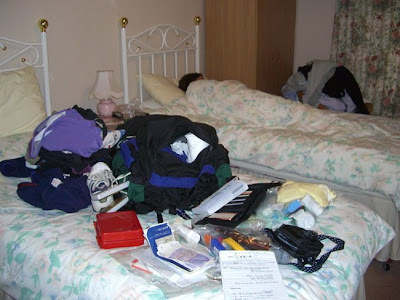 This blog is an online documentation of our trip. I've borrowed directly from journal entries and e-mails that I sent to people along the way (with some editing of course!). I have tried my best to condense each day into a readable length without compromising too much detail. Also, blogspot automatically scales down these pictures, but if you click on a photo, a larger version will show up for you to examine more closely if you so desire! And if you want to hear more about something in particular, just e-mail me! Eagerly waiting in the airport. Such energy! After waiting for the train, we got in ours, and it turned out we totally could have gotten on the 12:00 because it didn't matter the time you took the train. Live and learn I guess. The train ride was great. We rode from the airport to Manchester Piccadilly and then changed trains to get to Carlysle (which is actually northeast of St. Bees but it's still the easiest route to get there) and then another to St. Bees. Thank goodness for helpful train staff as our tickets were really confusing. I just loved watching the hillsides and all the sheep and the brick houses. It made me nostalgic for Belgium. The train to St. 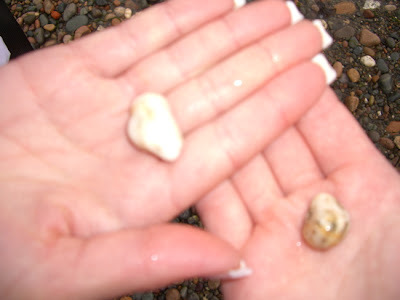 Bees went down the coast of the Irish Sea (stormy and windy! The clouds hung so low; sometimes I felt like I could reach out and touch them - something we would get very acquainted with for the duration of the trip), and I am amazed at how they built those tracks. Sometimes it was going so slow around these windy hillsides and it seemed like we were going to fall into the ocean! When we arrived in St. Bees we went to town and to the Post Office to get food for tomorrow. YAY - DIGESTIVE BISCUITS. The best cookie things ever. I know it sounds gross, but I got hooked on them when I was in Belgium and I just don't understand how they aren't sold in the United States.... I'm so stocking up on those when we go home! :-) The cash machine at the post office would only take 'link' debit cards...must be British...which worries me a lot, we need to find cash, but I was able to run my card as credit to pay for everything, so that's good news find that I can do that. I'll be happy when we can get some cash though. 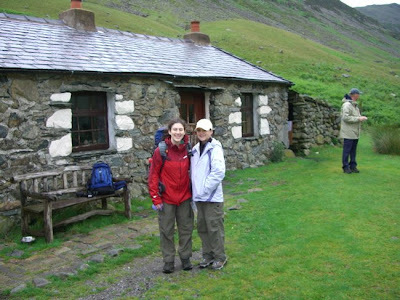 We then walked down and found our guest house, which is by the start of the walk, but a little ways from the town. Irene, the caretaker, is super nice and got us situated. We then walked back into town (jees...shouldn't we be saving energy here!) to look for food, but it turns out there was this celebration happening with the students as everyone was dressed in suits and gowns, and nothing was available....so....grocery store meal! 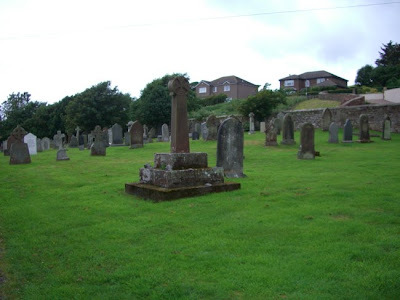 Walking back we detoured to the church and graveyard where there is a stone from the 10th century (although i couldn't find it). And then back to the B&B to watch some British 'Who Wants to be a Millionaire.' Tomorrow's the big day! St. Bees is a really interesting town. 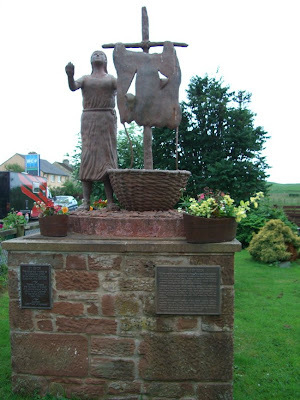 Legend has it that an princess from Ireland (St. Bega) landed here somewhere between the 6th and 9th centuries to avoid an arranged marriage with a Norweigian prince and asked the man who owned the land if she could have some to set up a convent. He said if it snowed, she could...and it did. And so St. Bees came into existence. will we be ready by tomorrow?! Bre fell asleep early and just woke up thinking it was morning and started to get ready. I asked her what she was doing and told her it was ten at night. Time is all screwed up right now. CLICK FOR MORE PICTURES FROM THIS DAY! We had breakfast at 8:00 and got down to the water around 9:00. Slightly raining - I guess a start that one should expect for England! (*note - I wasn't kidding here. We got rain EVERY single day. ) 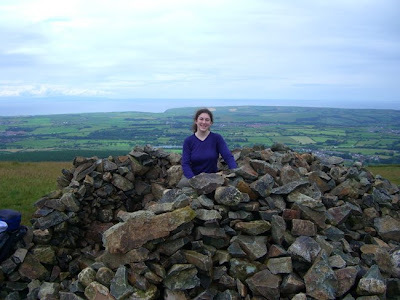 I guess Wainwright wanted to just kick us off with a bang because the hike started with a big climb up the hillside, looking over the Irish Sea, where we would follow for quite some time. 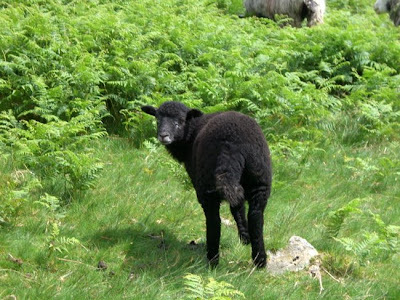 Okay I just have to say there are these sheep that I swear look like pigs. I saw one in St. Bees and really thought it was one. When I exclaimed to Bre to 'look at that pig!,' she laughed at me and gave me a look of pity, saying, 'Coty, those are SHEEP.' I don't know if shearing does that to all sheep, but boy, these ones are very funky! (*note - I later read about these sheep. 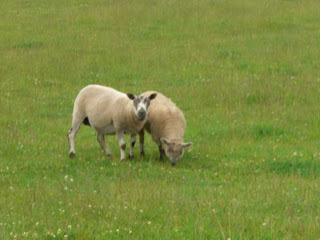 I can't remember their names, but they are commonly referred to as 'ugly sheep.' No kidding.) Not all the sheep are like that, but boy are there sheep! Sheep everywhere! And cows and even goats, or maybe they are just sheep with horns. I don't know. across the country to later be deposited in the North Sea! 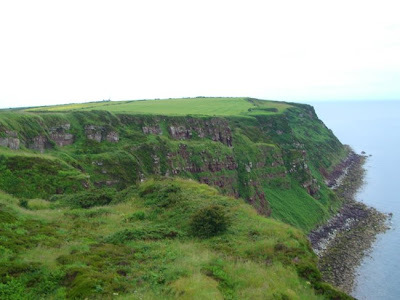 So after leaving the seaside walk, - what beauty - green with the stone walls that I can't imagine building and the Irish Sea crashing upon the cliffs, we got to the part where we left for the towns of Moor Row and Cleater. Here we had our first mess up. 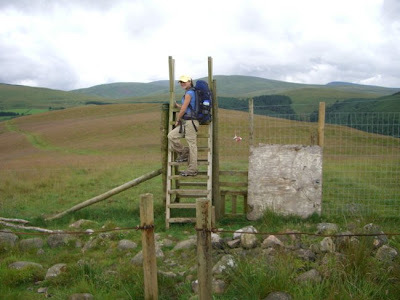 After this part where we crossed the right hand gate Steddy's said to go down and go under an old railway. Well I thought that meant go down right after the gate. Nope, I just led us into a very very wet grassy place that completely soaked the bottom of our pants and soaked Bre's shoes. 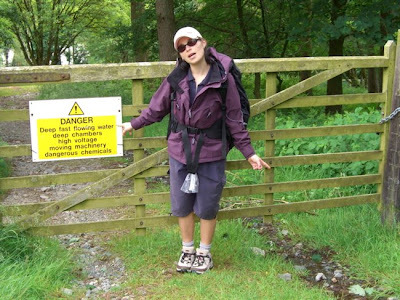 Great - we got back on the path and then saw the sign to go down. Note: don't leave path looking for other if one does not exist yet! And so down to Sandey Pond which as far as I can tell, is a muddy bog and to this forest .... Well at this point we had our first serious map consultation. We chose to go on a path in the forest and realized it was a mistake. Luckily some people were approaching and we all consulted - a nice couple named Ken and Jane. [We ended up meeting up with them a lot more along the walk and they proved to be great walking buddies! It seemed like every time we were in a sticky situation, ah there Ken and Jane would round the corner and we would all figure it out together] Good thing we met them because there was a part where Stedman's was really not quite right in my opinion. What's wonderful about the walk was that whenever we needed help someone always showed up! Then came the downhill which is the absolute worst. My toes felt were pushed up to the end of shoes and killed! 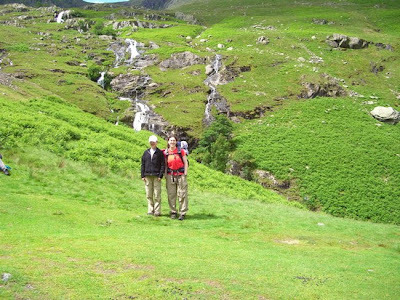 So as Dr. Suess wrote, what goes up must come down and down, and we arrived in a beautiful little valley that would lead us to Ennerdale Bridge. We walked through here with even the sun poking through at times. With all the sheep wandering (they're everywhere!). But this is also when the feet started hurting and the slight aches started creeping in. We got to the end of the path and sat down to rest, where I conveniently put my hands in a patch of stinging nettles. 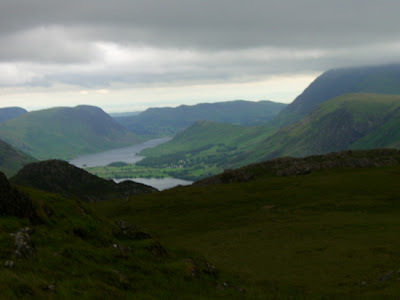 Then back up again and off to what we thought was Ennerdale Bridge. Luckily a car came beeping the horn and told us we needed to go the other way. Thank goodness for people!! And so we chugged into E.B. around 4:30, tired and sore. 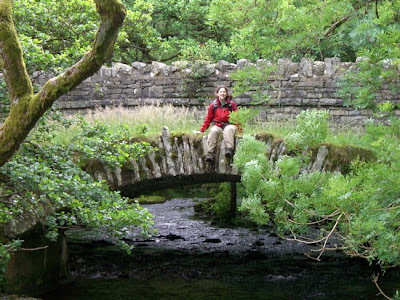 We rested a couple hours and then took a gaunt (I really should say hobble here) to The Shepherd's Arms for a bite to eat. And then back to the Cloggers and good night! Down the other side. Leaving the sea and on to the lakes. CLICK FOR MORE PICTURES FROM DAY 1! How do I feel? Yes, achy. Yes, my right foot is really bothering me, but other than that I feel good. I feel like I can accomplish something and do this walk, although at the beginning of the day I sure did feel the opposite. Last night the owners of the place we stayed at talked about going up into the Lake District and how the temperature can drop to freezing and how last year emergency people had to take a girl down who didn't dress for the weather. Ominous to say the least. We got up and it was pouring out and the wind was howling. I got this nervous feeling right at the beginning and Bre's back was really hurting her because of her pack. I tried to encourage her to leave it at the Cloggers and call Packhorse, a service that will carry your bags to each destination, but she thought she would be okay. 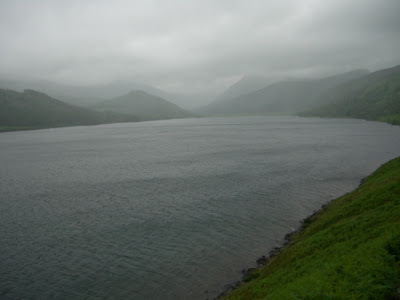 So we approached our first scenic point, Ennerdale Water, with the wind howling and rain blowing sideways. Luckily, just as everything was feeling quite gloomish, Mountain G oat showed up (his name is really David). His presence was a welcome comfort, just knowing others were out there. It's too bad the weather couldn't have been better around the water as the pictures I had seen of it seemed so lovely. 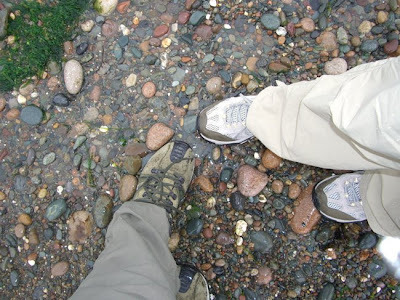 Instead, we bundled up, hunkered down, and made it around the treacherous rocks to the other side, along the way passing a few people, including Ruth and Kimmie, the Australians. On the other side we met up with Ken and Jane, our faithful co-navigators. Ken gave me his walking pole to use for the day because of my foot. I just love all the friendship that we are striking up already. Crossing a big field, I saw on Steddy's that there was supposed to be a field centre at the other side. Imagining a lodge with a warm fire and maybe a hot drink, I thought we could stop there to put some icy hot type ointment on my foot, but alas, it proved to be a cold looking barn, so we decided to try the youth hostel up ahead. Strike two...closed for renovation. And so we trekked on. Somehow Ken and Jane got ahead and at this point, and Bre decided she just couldn't carry her pack anymore, as it was hurting her back too much. Mind going in quick thinking mode, I ran up to Ken and Jane, gave them back their pole (just in case we didn't see them again). Then I put my essentials in Bre's pack and ran back to the field centre in hopes that someone would be around. I knocked on the door, but the woman who answered might as well not have been there. What a B*!?! I do not recommend that place to anyone. She was mean and lacked all empathy. I explained to her my situation, asking if maybe I could leave my bag there and have Packhorse pick it up. She pointed me to the pay phone and wouldn't let me know whether anyone would be around or not for somebody to pick up my bag. So I went and called (thank goodness I had coins. I doubt that woman would have lent me any) and got a hold of Packhorse. This woman, unlike the other, was so friendly and accommodating (We actually got on a first name basis for the rest of the walk, and it even got to the point that I didn't even have to say who I was! She just recognized my voice. Or maybe the American accent...) They normally didn't pick up around that area, but she worked with me and said they could pick it up tomorrow. So then I went back to that awful woman and she was like, "put the bag in the barn." Argh. Placing it there, re-calling Packhorse to let them know where they could find it, I crossed my fingers and set off, praying that I would see my bag again. Then, hoping that maybe the third time would be the charm, I asked the woman if she could maybe give me ride up the road back to Breanne, and she kind of started closing her door and said, "I'm not really able to do that." What a mean person. arrrhrhr...it makes my blood boil just thinking about her. So then I went up the road, and the guys working at the Youth Hostel (which was closed for renovation) were in their cars having lunch. So I approached them and these two warm, nice men agreed to give me a ride. Bless them. They were so nice and giving, not like that woman who couldn't even give me her phone number to the place. 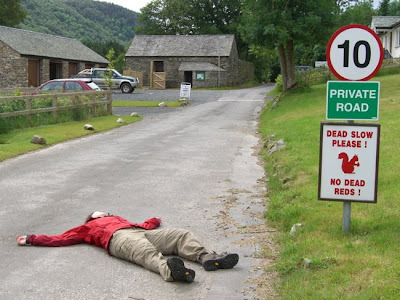 So then we drove up the road and kept going and going, asking people if they'd seen Bre but no one had. Finally, we were getting to the end of the road and these guys had seen her, but she'd gone up ahead. Phew. She had made it almost the whole way up the road while I was gone. Jeez! She can walk if she wants to! So I said a HUGE thank you to them. (THANK YOU THANK YOU!) 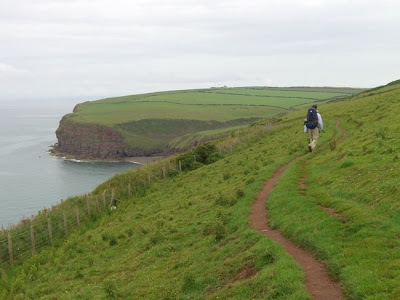 and worked my way up the path to Black Sail Youth Hostel, the most remote hostel in all of England. 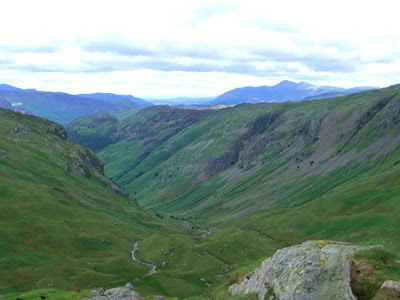 It is at the foot of the peaks of the Lake District, and there is no road that goes to it (in other words, no cars). It was such a welcome site, and inside was a cozy room and some fresh baked banana bread and tea. And there, at Black Sail, all the sudden it seemed like everyone doing the walk came together and gathered. Taking a lunch break, sharing stories from the first two days, commiserating with others about various aches and pains. So wonderful! It was also here that our little camp formed, the navigators, Ken and Jane; the two Australian women, Ruth and Kimmie, and this couple that was only doing the walk halfway. Ruth is also having the same foot issue as me, which in its own twisted way is a comfort! We made it to Black Sail!! So off our little company took trying to navigate to and up Loft Beck. I think it was here that all the camaraderie developed between us all because we all encouraged each other up and just the presence of everyone made it much easier. It was by far one of me steepest climbs I've ever done. But we were all together and we all did it and the top was amazing. Beautiful views the surrounding peaks and lakes in little nooks and valleys below. And there was this patch of sunlight just in this one spot hitting the water back where we had just come. Wow. And then up high we were walking and I just started smiling and laughing because we had made it. I had got through the biggest ordeal. So then our group continued on, heading down to Honister slate mine which was actually really cool to see all the slate. Enormous slabs of slate. Again, here was downhill, which again killed! And it continued to be downhill the rest of the way, but thank goodness, Ken gave me his trekking pole again which I think I used a little to much because now my leg thigh muscle is feeling like it's pulled. MORE PICTURES FROM DAY 2! How do I feel? Well other than my foot, I feel great. 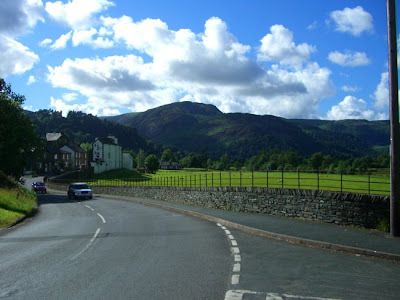 We are in the nice little town of Grasmere, where William Wordsworth lived. It's very touristy and I've bought some postcards to send to people. It's been nice to get the afternoon to walk around and do the touristy thing for a bit. We got coffee and hot chocolate at a fancy little cafe and ate great food (lots of pasta for me) at a fancy looking pub (there's not really any place that isn't fancy in this town) where I talked to a woman who was doing the walk east to west. She is from California and it is her third time doing it. Dedicated I'll say! 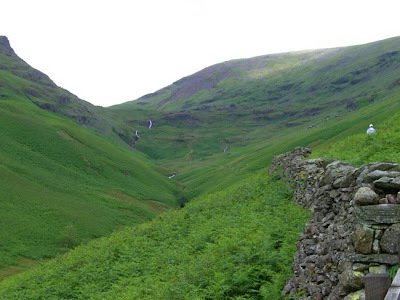 Today was fairly straightforward climb up Greenup Gill to Lining Crag and Greenup Edge (Yes, it was very green!) 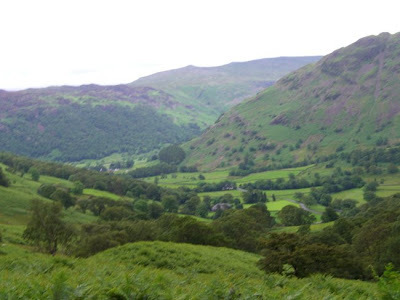 and then down the other side into Grasmere. We got our daily greeting by Mountain Goat before he hopped along past us. 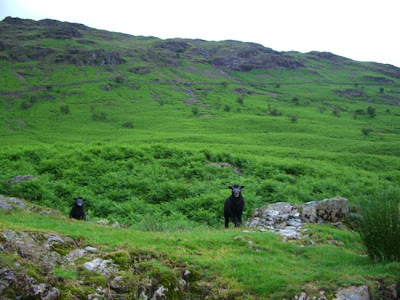 Sadly, today was our last day with him as he continued on to Patterdale today without stopping in Grasmere. Soon all of our schedules will become different and we will have to say goodbye to people, but hopefully meet others! So up and up we went. The walk was shorter, but the climb was longer and steeper than the day before, although the path was fairly straight forward. Well, for the most part...Breanne is a good navigator! With her leading the way we made it up and through a part that was a little unclear (good ole' Stedman)...she just kept looking for cairns instead of consulting the book's bad map. The Australians and Mountain Goat actually got lost and were able to get back on the right track because they saw her walking down the path in the valley below! Yay! I passed a few people doing the walk from East to West, it was encouraging to see that indeed, they had made it this far and I can make it too. Today I was really thirsty the whole day and drank the entire water bottle. I wonder if it has to do with the bloody nose I got last night.... I'm also seeing more sheep than I have ever seen in my life. They are EVERYWHERE. And I'm continually amazed at the stone walls that are all around, even up in the steepest parts. I can't even imagine building those. It's amazing what people can do. 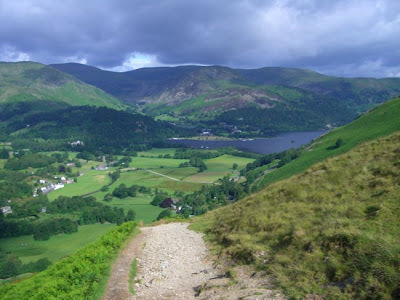 Tomorrow: Off to Patterdale! How do I feel? Better and better. I'm no longer achy and my foot didn't really give me a problem today, although it is starting to hurt a bit now and my left knee is hurting which I hope will pass. It seems as if it's not one thi ng it's another. Today was really good. We decided to start off a little later than usual (around 10:00 although I think it was a little closer to 11:00 when we actually set out) as the walk wasn't supposed to be that long and we heard it was supposed to clear up in the afternoon. However, when we started out it was a complete downpour and we could only cross our fingers that it would clear up later. 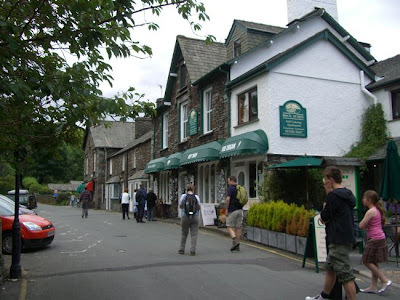 We also had some trouble getting out of Grasmere as Steddy wasn't very clear, so after wandering around somewhat randomly, we finally spotted people with backpacks which meant one thing: fellow Coast-to-Coasters. We ended up meeting with this guy who was named Steve, and spent the rest of the day hiking with him. It's always enjoyable to hike with others and chat and get to know each other. Right off the bat we made our ascent up Grisdale Tarn. 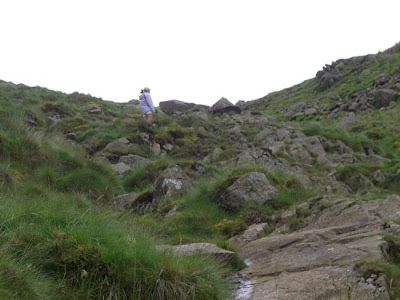 It was quite the ascent; not as steep as the others but long and just steep enough to wear on you. I also found myself getting more thirsty and our water was almost out by the top. Luckily the rain did stop, and it did start to clear up, with the sun actually poking through quite a bit. 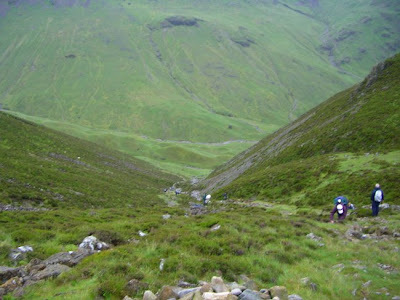 On the way up there were some great waterfalls and we were able o see St. Sundays Crag, Helvellyn and Striding Edge. (high route peaks that one can climb to if they so desire) I must admit that they seemed much less daunting than what I imagined and I was halfway tempted to try one, except then a little reminder from my foot or knee would pull me back to reality! 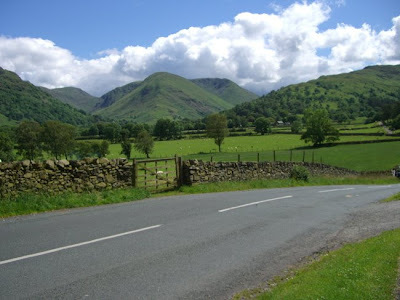 But even so, our route was amazing, with the views of the valleys and the descent to Patterdale, going through a really nice place of farms and a river, all being picturesque. 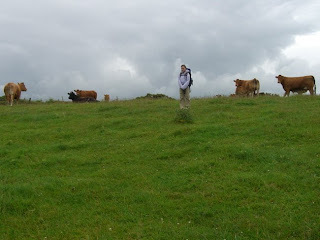 And cows - after seeing all the sheep, I'll admit that seeing the cows threw me off! We met up with the really nice couple who are only doing the walk halfway and ate lunch with them in the brief period of sunshine . I'll have to say that something about the sun and sitting there with the waterfalls and chatting, everything just seemed so perfect. Tomorrow I just hope the weather isn't too bad and that my knee does all right. Please hold up! It's also the last day in the Lakes. Wow - they are beautiful and I will miss them. It seems that at this point people's schedules start getting different and we will all be soon parting ways. Its sad to think that the camaraderie that's built up so quickly, that close feeling that we got because we all started the walk in all our unknowing - its going to come to an end. And then a new stage will begin and hopefully new faces! Day five here we come. MORE PHOTOS OF DAY 4! How do I feel? A bit tired and worried about my knee - now that there won't be so much up and down I hope it does better. My foot is doing great though! 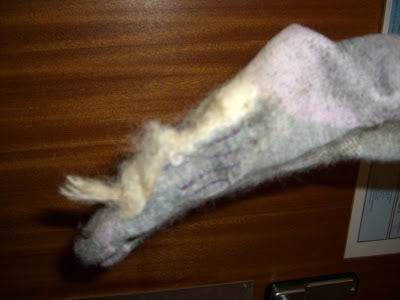 Back at the farm last night, I mentioned to the guy that my foot was bothering me and he said fresh sheep wool would do the trick. And what did I find sitting on top of my boots this morning?! None other than a freshly sheared batch of sheep wool! And it's seemed to have done the trick. [And it did too. For the rest of the trip I didn't have a problem and I actually left it sticking to my socks the whole time... gross I know, but what can I say?!] It's also a wonderful cushion and even a little nice warmth without sweat! I know, pretty gross - but it worked! Today Kimmi and I walked from Patterdale to Shap while Ruth and Breanne took the ferry down Ullswater and then the bus to Shap. I'm glad it worked out that way as I really didn't want to tackle the long 17 miles in tricky navigation by myself. And I'm so glad that we met those two and got to know them. Kimmi was so much fun to walk with, and we had a fun time finding humorous ways to liven up the walk. Like posing as a dead red squirrel or pretending to run away from bulls. 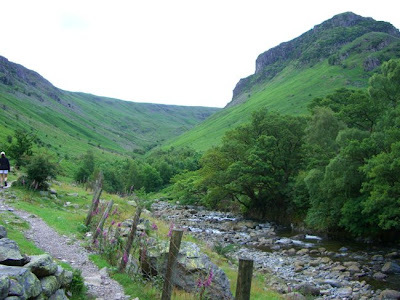 We started off hiking up out of Patterdale and it wasn't half bad out with sun coming and going. So we climbed up and up to Angletarn where the wind started howling, but at least then it was still pretty nice out although we could see the dark clouds coming up on the horizon. Then we went over the tarn and came to this little dip and lake that had these islands and it just looked like a little oasis with palm trees. I joked that we had been transported to the tropics (without the heat though). 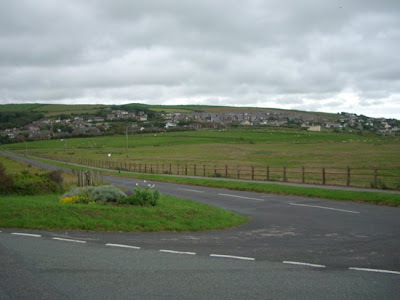 It was here that we met up with 5 guys who were camping the C2C and were trying to head all the way to Orton by tonight. I don't know if they ever made it because we kept up with them pretty much the whole day and saw them at the co-op in Shap when it was POURING down rain around 4:30. But on we went, the wind blowing ever harder and finally, what seemed inevitable, the rain. As we headed up to Kidsty Pike it was blowing sideways, practically knocking us over, and I'll have to admit, there is something about that kind of weather that makes it exciting and gets the adrenalin going. I'm glad I had Kimmi with me too because not only was it pretty lonely feeling way up there, but the navigation was a bit tricky, and there were a couple of spots we kind of had to backtrack. 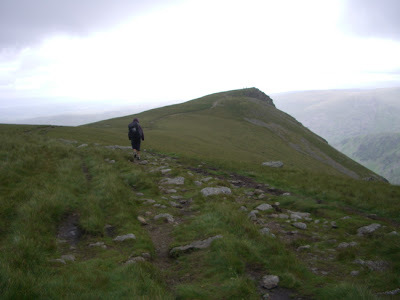 But we made it to the top of Kidsty Pike, our highest point of the walk, but didn't stay long to reflect, but instead quickly started heading down because the temperature was very cold with all that wind and rain. While doing this Kimmi saw some deer bounding up ahead trying to cross and they came over right in front of us. I wonder how they are able to bound their ways up and down those hillsides. It really is amazing. 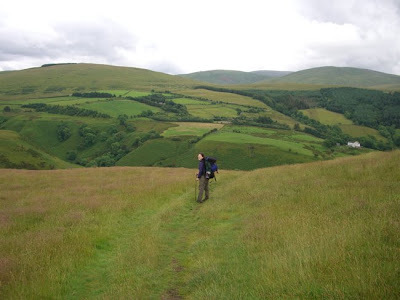 We really don't use our bodies anymore - I just think how in the past people would do these walks from village to village over the fells as day walks. They would do it all the time - and I think people still do it today - but for the most part, we just use cars. All these paths that we are following on this walk are those old trails that people walked to get village to village. 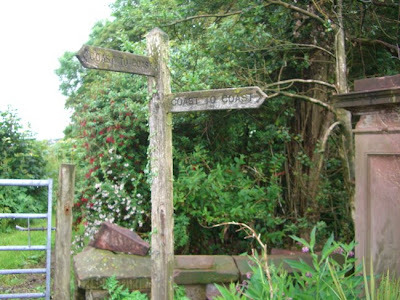 Once we got out of the Lakes, there would be signs on the paths, pointing down different routes saying "this way to such and such." Coming down we met these wonderful guys who all had worked together at a glass factory outside Manchester and once a month they all go on these hikes. And they were all so classically British! They were telling us about the town that used to be where the Hayes water Resevoir is and the road on the other side that was called Coffin Road because they would carry people who died along the road and over to Shap. And one of the guys, Frank, took our picture because he documents and wr ites about all their walks - this one being the 108th!! 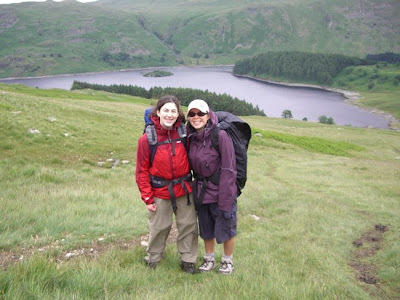 So then we finally made it down and started the trek around the Hayeswater saying goodbye to the Lake District. 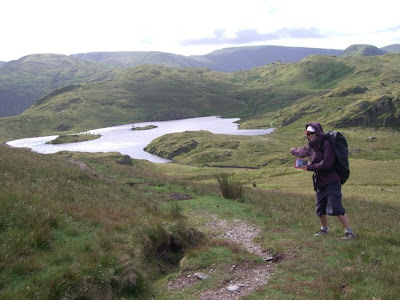 This is where my knee and upper thigh started hurting, and I just had to grit and bear it for the rest of the walk around the lake and then through fields into Shap, where we arrived as it started a complete downpour that really was quite cold! I had to have a hot chocolate to get the chills out as our B&B, the Fell house, had no hot water and it was FREEZING - and their website made it look all nice and fancy. Instead it just felt lonely and cold. All of Shap really. It could have been the nasty weather though. But anyway - Stedman really made this section after the Lakes to be a lot worse than it was. We actually had some fun. I pretended to be a dead squirrel in the middle of the road, Kimmi pretended to run away from a bull, and we joked about it being kind of like a treasure hunt trying to find our way around the fields. "Cross the fence look diagonally and spot the grove of trees. 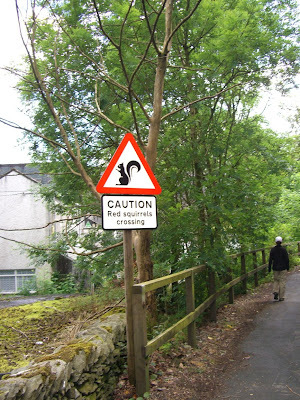 head there and turn right...etc.. etc.." Also little signs started popping up on the footpath saying "Discover Eden." Hmmm... I'm still looking I guess. I wonder if we will ever discover it? 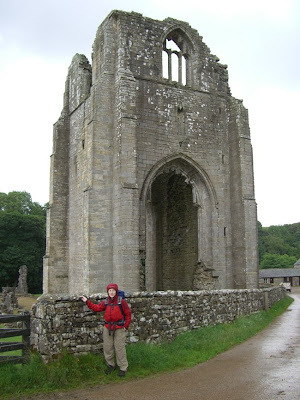 When we reached Shap Abbey, an old abbey that was destroyed during the reign of Henry VIII, it started to POUR. 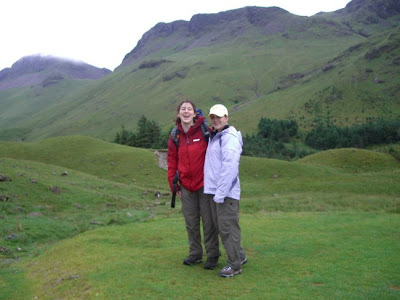 The only thing we could do was put on our raincoats and trudge on, reaching Shap around 5:00. Arriving soaking wet, I got changed (no hot water or heat..aaah!) and Bre and I met Kimmi and Ruth for dinner at the Kings Arms. It was bittersweet as this was our parting of ways. 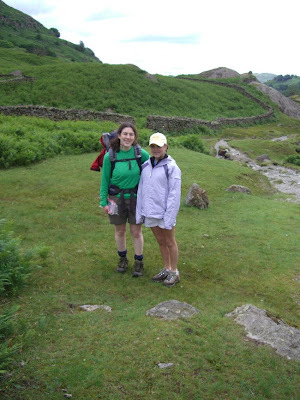 They are going to do a 21 mile walk tomorrow where we were splitting it into 2 days. I promised Kimmie I would think of her as I'm eating my homemade chocolate cake in Orton (where we are stopping) while they are trudging on. All the more power to them, but I think I'll have my cake thank you very much. But they have been such a good company these past few days and I won't forget them. Perhaps someday we will meet again. Maybe for another trek somewhere. MORE PHOTOS FROM DAY 5! Current adventure: Planning a bicycle trip from Paris to Rome for Aug/Sept. 2019! 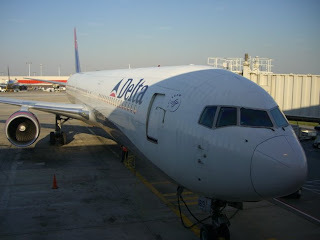 A GREAT blog that I used to plan our trip. Includes packing tips..I used their's and you should too! Packhorse - baggage carrier who saved me during a sticky situation. Highly recommended! !